The exceptional performance of INTI’s Cambridge A Level students have once again led to multiple awards for them, including “Top in the World” and “Top in Malaysia” at the recent Outstanding Cambridge Learner Awards ceremony held at Hotel Armada, Petaling Jaya. Tay Weiyang of INTI International University was awarded Top in the World for Economics, Top in Malaysia for Mathematics and Second place in Malaysia for Best Across Four Cambridge International AS (Advanced Subsidiary) Levels. “My A Level success brings me one step closer to my aspiration of pursuing studies in economics in the UK or engineering in the US. The great thing about studying at INTI, which has helped me get this far, is the distraction-free campus and the close knit-community where friends are always there for me,” said Tay, a full scholarship recipient who believes in enjoying his time as a student with the many activities available on campus. Adrian Siew Peng Leong was the outstanding performer at INTI International College Subang. 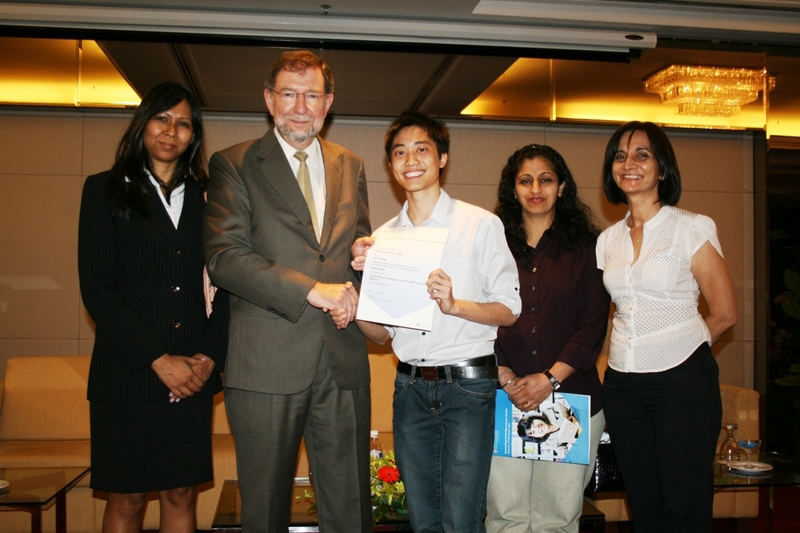 He received the Top in Malaysia award for Mathematics and explained how being a student at INTI helped in his success. “I like the small class sizes. You get more attention from the lecturers and they are always there for you when you need their help. My Mathematics lecturer is a perfect example of the dedication and commitment of lecturers at INTI. Her positive attitude to teaching and everyday life is so strong that it actually rubs off on us students,” he said. Tay Weiyang stands proud with his awards. 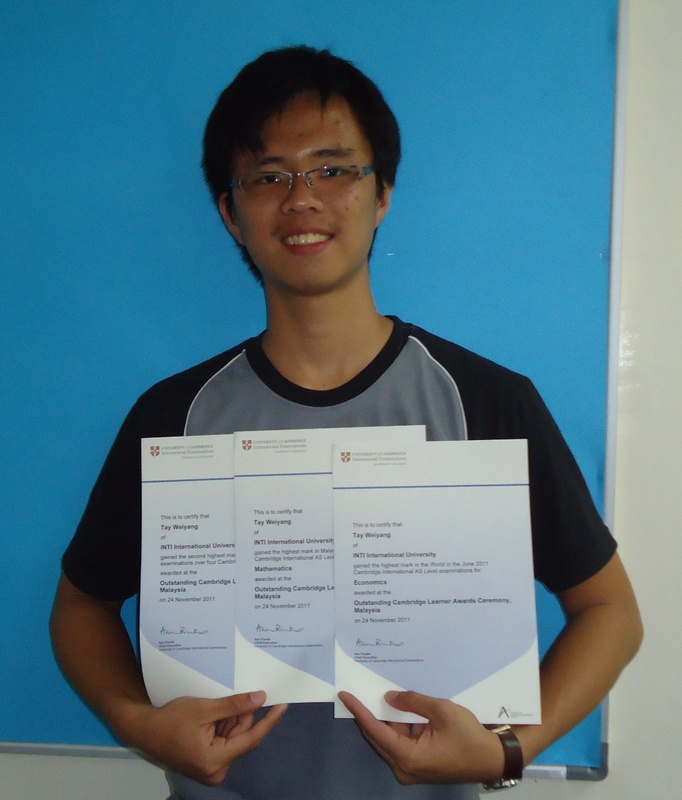 Apart from Tay and Siew, Ho Jia Min of INTI International University was awarded Second place in Malaysia for Best Across Three Cambridge International AS Levels. INTI International College Penang’s Khoo Teng Jian was awarded Top in Malaysia for Mathematics and First in Malaysia for Best Across Four Cambridge International A Levels. Khoo had gained recognition earlier this year for Top in Malaysia for Mathematics and Second Place in Malaysia for Best Across Four Cambridge International AS Levels. He scored an average percentage uniform mark of 99.8 for his A Levels and is currently pursuing Electronic Engineering at the University of Southampton in the UK. His outstanding A Level result is exemplary of the consistency displayed by INTI’s top students throughout their study period. Adrian Siew (3rd from left) is congratulated by former Cambridge Assessment Syndicate member Dr John Guy OBE and INTI academic staff. Khoo’s parents, Mr and Mrs Khoo Boo Aun, were ecstatic over their son’s excellent results and attributed part of his success to the rich learning environment at INTI. “INTI’s lecturers are very dedicated and hardworking. When Teng Jian first set out to look for a college for his pre-university studies, he did a careful evaluation of the options available and chose INTI for its better quality. He was also awarded a full scholarship to pursue his A Level studies,” said Mrs Khoo, who together with her husband had travelled from Penang just to attend the ceremony. Students of INTI benefit not only from the over 25 years of experience and strong track record that INTI offers, but also gain from the global synergy and resources that Laureate International Universities provides. INTI is part of Laureate International Universities, the world’s largest private education network with a presence in 29 countries, with more than 60 accredited campus-based and online universities and 130 campuses, serving over 675,000 students globally. For further information on INTI’s Cambridge A Level programme, please call 03-5623 2800 / 06-7982000 / 04-631 0138.